Share this product and receive a $4.00 sharing discount. Kids will LOVE to Brush! Growing kids will have a blast brushing their way to a happier, healthier mouth with the Baby Buddy Brilliant Kids Sonic Toothbrush! 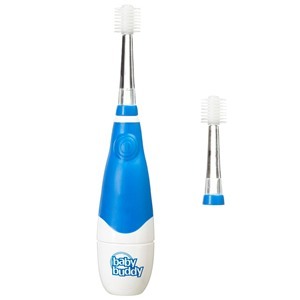 Super-soft bristles and a gentle sonic vibration create fizzy water bubbles that clean your child’s teeth and gums with ease. Turn brush time into a party as the Brilliant Kids Sonic lights up and buzzes for two minutes so that your child knows how long to brush for a healthy smile. The brush has a 30 second notification to help train your toddler or child how to move from quadrant to quadrant when brushing (upper right, lower right, lower left, upper left). The Kids Sonic Toothbrush will leave both you and your child grinning (and maybe even giggles, as kids love the sonic vibrations). With the Baby Buddy Brilliant Kids Sonic Toothbrush, brushing with your child has never been so much fun! The patented all-around bristles design, combined with the gentle power of sonic technology, delivers softer, more effective brushing. 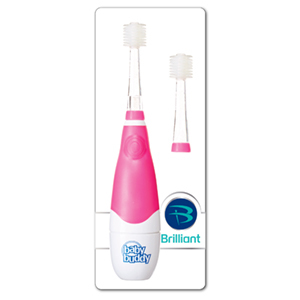 The circular motion of the sonic vibration generates water bubbles from the wet bristles as you brush. These bubbles gently hit and remove plaque from the tooth’s surface. Co-developed with the Osaka University Infant Dental Clinic, circular microfiber bristle rings layered together with spacing washers make it more effective to remove plaque and keep the brush clean. 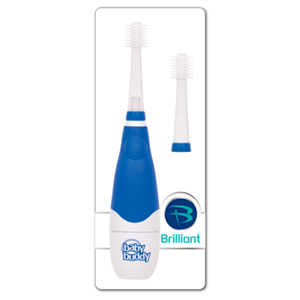 Soft micro fine bristles protect the gum. Gently brush side ways or in a circular motion to remove plaque formed between the gums and teeth. The flashing LED light makes it fun to brush. The LED light also enables you to look into your child’s mouth. Wet bristles and gently brush teeth, gums and tongue all at once. The Brilliant Kids Sonic Toothbrush can be used without toothpaste. The Brilliant Kids Sonic Toothbrush lights up and vibrates in 30 seconds intervals for the two full minutes of recommended brushing time. Rinse well to remove toothpaste residue. Store upright in well- ventilated spaces. The Kids Sonic Toothbrush can be used twice as long as traditional toothbrushes; but for sanitary reasons, it is recommended to replace the brush head every two months, or when bristle rings are spread. Do not sanitize with boiling water more than 175°F to avoid deformation.